These polarimeters contain proven optics, pioneered by Bellingham + Stanley, featuring "no maintenance" yellow LED and interference filter. Combined with a photodiode detector these technologies allow for the reading of samples of up to 3.0 OD at the commonly used sodium (589nm) wavelength. 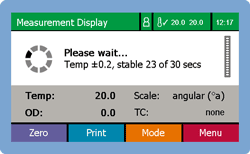 Both instruments feature angular and sugar scales (ISS) and can be programmed with user scales as well as industry standard methods for displaying invert sugar, inversion (A-B) or when applying other factors such as tube length and concentration, Specific Rotation (or concentration when entering specific rotation). This flexibility makes them ideal for use within laboratories where compliance with Pharmacopoeia is required. ADP400 Series polarimeters have a resolution of 0.001 angular degrees (°A) and are capable of reading to an accuracy of ±0.010 °A. When working under laboratory controlled conditions, ADP400 polarimeters also offer excellent reproducibility of up to 0.002 °A. Additionally an easy-to-use Methods system gives convenient access to popular measurement types including continual measurement of Optical Rotation, Specific Rotation, Concentration, Inversion, or our new "single-shot" measurement which gives a snapshot result at any given time. You can take readings with the ADP400 Series polarimeter in either continuous measurement or our new 'single-shot' mode. In continuous mode a reading is taken over a set period of time and a stabilised result displayed at the end of the period. 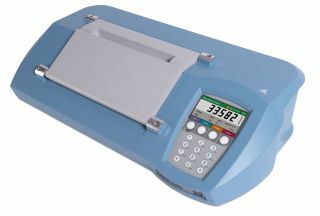 It is excellent for monitoring instrument and sample stability, giving the user a "feel" for the reading obtained. The ADP400 Series' new 'single-shot' mode is ideal for pharmaceutical applications where a discrete value is provided without the interpretation of the operator, satisfying operating procedures where interpretation by a third-party, the operator, is not permitted. 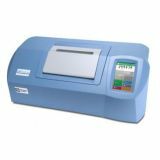 The ADP450 polarimeter with patented XPC technology features interchangeable contact Peltier plates facilitating measurement at a stable temperature using Peltier control. This stabilises the temperature of the sample being measured, making for easy readings in the laboratory. SMART temperature stability ensures accurate reading for pharmaceutical applications. The PHR-MEAN Method allows a number of different readings to be taken from a batch of samples and the statistical report, showing the average, high and low results together with standard deviation can then be printed or stored to file. With SMART temperature stability enabled, the ADP450 will only give a result when the instrument has displayed a stable temperature over a predetermined timeframe. 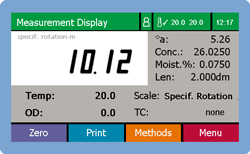 ADP400 Series polarimeters come equipped with a new full colour 4" high definition display meaning results are clearly visible to the operator. The expanded memory ensures that over 8000 measurements and recorded logs of instrument configuration can be saved and viewed or output to LIMS or Secure PDF. Calibration and configuration of the instruments can be password protected, accessible by keypad entry or, for convenience, using a fully configurable RFID tag. This, together with the audit trail, facilitates operation in environments conforming to FDA regulation 21 CFR Part 11 or GLP. The ADP400 Series polarimeters incorporate a number of industry standard interfaces making it easy to connect to peripheral devices including barcode readers, printers and USB memory sticks for external storage. With the addition of a USB memory stick operators can output results to a secure PDF using the "Print to Secure PDF" feature that is now commonplace amongst many Bellingham + Stanley laboratory instruments. The USB port can also be used to accept RS232 via an available adaptor. For those looking for a fully featured polarimeter without the need for internal temperature control, the ADP430 polarimeter comes complete with all the features of the ADP450 minus our new XPC Technology. Designed as a replacement for the popular ADP410 and 440(+), the ADP430 is ideal for users who prefer or already have waterbaths for temperature control or where temperature compensation or stability is not required.